I know that I’ll be making a pie for Thanksgiving dinner, so I’m getting the craving to stuff my face with cake out of the way ahead of time. 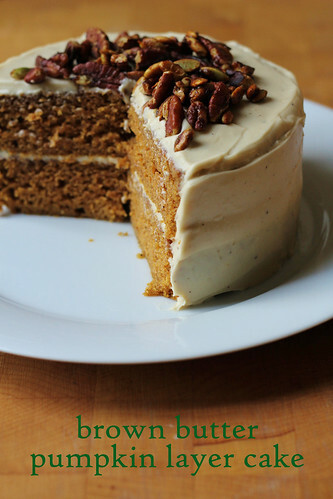 I’ve actually been itching to make this Brown Butter Pumpkin Layer Cake ever since I saw it on the cover of Fine Cooking last year. And it was everything I’d hoped for in a spice cake, complete with cream cheese frosting and a crunchy topping. P.S. : Don’t forget to enter my BOOK GIVEAWAY, if you haven’t done so already…. Steph’s Notes: You can substitute 1-1/2 cups canned pumpkin purée for homemade, if you like. If you do choose to make the purée, you can do so up to 2 days ahead. The frosting amount is a bit on the skimpy side. I made it work, but there wasn’t a lot of extra play around with. If you’d like more leeway, I’d suggest a 1.5x recipe. -Make the pumpkin purée (if not using 1-1/2 cups canned): Position a rack in the center of the oven and heat the oven to 350°F. Brush a 9×13-inch baking dish with the oil. Put the pumpkin halves in the dish cut side down and bake until tender when pierced with a fork, about 45 minutes. Let cool. Peel the pumpkin and purée the flesh in a food processor until smooth. You’ll need 1-1/2 cups of the purée for the cake. Refrigerate or freeze any remaining purée for another use. -Make the cake: Position a rack in the center of the oven and heat the oven to 350°F. Butter and flour two 9-inch round cake pans with removable bottoms (or butter two 9-inch round cake pans, line the bottoms with parchment, butter the parchment, and flour the pans). Melt the butter in a heavy-duty 1-quart saucepan over medium heat. Cook, swirling the pan occasionally until the butter turns a nutty golden-brown, about 4 minutes. Pour into a small bowl and let stand until cool but not set, about 15 minutes.In a medium bowl, whisk the flour, baking soda, cinnamon, ginger, salt, and cloves. In a large bowl, whisk 1-1/2 cups of the pumpkin purée with the granulated sugar, brown sugar, eggs, and buttermilk until very well blended. With a rubber spatula, stir in the flour mixture until just combined. Gently whisk in the brown butter until completely incorporated. Divide the batter evenly between the prepared pans. Bake the cakes until a tester inserted in the center comes out clean, about 28 minutes. Let the cakes cool in the pans for 10 minutes. Turn the cakes out onto racks, remove the pan bottoms or parchment, and cool completely. -Make the topping (while the cake bakes): Melt the butter in a heavy-duty 12-inch nonstick skillet over medium heat. Add the pecans and pepitas and cook until the pecans brown slightly and the pepitas begin to pop, about 2 minutes. Sprinkle in the brown sugar and salt and stir until the sugar melts and the nuts are glazed, about 2 minutes. Remove from the heat and let the mixture cool in the skillet. -Make the frosting: Melt the butter in a heavy-duty 1-quart saucepan over medium heat. Cook, swirling the pan occasionally until the butter turns a nutty golden-brown, about 4 minutes. Pour into a small bowl and let stand until the solids settle at the bottom of the bowl, about 5 minutes. Carefully transfer the bowl to the freezer and chill until just firm, about 18 minutes. Using a spoon, carefully scrape the butter from bowl, leaving the browned solids at the bottom; discard the solids. With an electric mixer, beat the butter, cream cheese, brown sugar and pinch of salt on medium-high speed until light in color and the brown sugar has dissolved, 2 minutes. Gradually beat in the confectioners’ sugar and continue beating until fluffy, 1 to 2 minutes. -Assemble the cake: Put one cake layer on a cake plate. Spread 1/2 cup of the frosting on the layer and top with the second layer. Frost the top and sides of the cake with the remaining frosting. Arrange the topping on top of the cake and serve. The assembled, frosted cake can be covered with a cake dome and refrigerated for up to 2 days. Serve at room temperature. I love the way you describe the topping as “Cracker Jackey”. I’ll definitely have to make this gorgeous cake sometime during the holidays! this looks INSANE. like, i want to eat this for dinner tomorrow night insane. yum! beautiful cake! this would be perfect for thanksgiving. Is it strange that I prefer cake to pie? so do i, to tell the truth.